Let the beauty of brides who have gone before you provide inspiration for your special day. 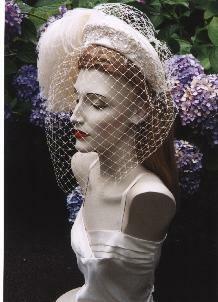 Click here for more images of custom bridal headpieces. Contact us at info@cynthiascenturies.net to discuss the creation of a headpiece and veil which will express your uniqueness. Custom Bridal Headpiece of satin with simulated pearl and sequined appliques;luxurious curled tripled ostrich plume and large diamond patterned millinery veiling.